[149 Pages] In 2016, the health ingredients market was valued at USD 67.98 Billion and projected to reach USD 101.32 Billion by 2022, growing at a CAGR of 6.96% from 2017 to 2022. Growing consumer inclination towards health food and fitness to influence the growth of the health ingredients market. 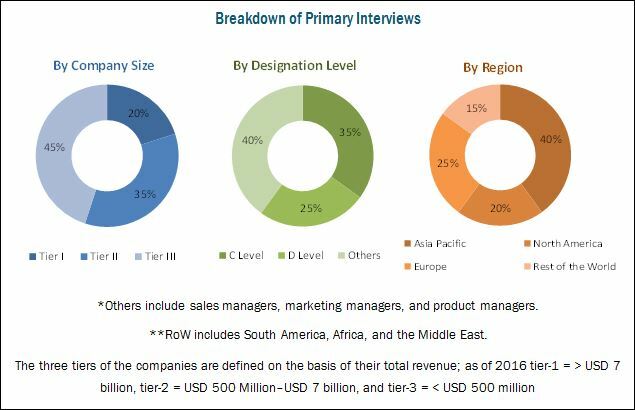 The research methodology used to estimate and forecast the health ingredients market begins with capturing data on key players, their revenues through secondary sources such as company annual reports and press releases. The overall market size was arrived after validating with primary interviews and secondary research which includes, publications and statistics by WHO (World Health Organization), CDC (Centres for Disease Control and Prevention), American Society for Nutrition, and FAO (Food and Agriculture Organization). Both “top-down” and “bottom-up” approaches were used to estimate and validate the total size of the market. These approaches were also used extensively to estimate the market size of various dependent submarkets in the overall health ingredients market, which are then verified through primary research by conducting extensive interviews with key people such as CEOs, VPs, directors, and executives. Data triangulation and market breakdown procedures were employed to complete the overall market engineering process and arrive at the exact statistics for all segments and subsegments. The report studies about the interlinked supply chain operations between the upstream and downstream players. Archer Daniels Midland Company (U.S.), Associated British Foods (U.K.), E. I. du Pont de Nemours and Company (U.S.), Koninklijke DSM N.V. (The Netherlands), BASF SE (Germany) and Kerry Group plc (Ireland) are the key players in the health ingredients market. The report also covers the DIVE Vendor Comparison analysis which is based on the product offerings and business strategy adopted by the key players in the health ingredients market. Further breakdown of the rest of European health ingredients market into Greece, Russia, Spain, and other Eastern European countries. The health ingredients market is projected to grow at a CAGR of 6.96%, in terms of value, from 2016 to reach a projected value of USD 101.32 Billion by 2022. Shift in consumer preference from nutrition-based to health-specific food, increasing incidences of chronic disease, and rise in demand for fortified food & beverage products are the factors driving the health ingredients market. Increasing awareness and rising demand for function specific food among the global population, fuels the demand for health ingredients. The health ingredients market has been segmented by type into vitamins, proteins, minerals, prebiotics, probiotic starter cultures, nutritional lipids, functional carbohydrates, enzymes, and plant & fruit extracts. Proteins has emerged as the most widely used health ingredients owing to their multi-functional properties and their vast applications in sport nutrition, dietary supplements, and weight management. Based on source, the plant segment is estimated to have the largest market share in 2017. The global demand for health ingredients from plant source is higher than other sources. Factors such as changing consumer preferences from meat-based products to plant-based products is one of the main reasons that drive the market for plant-based health ingredients. 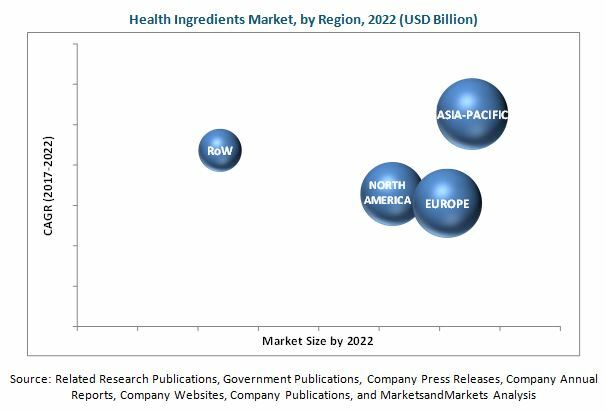 The health ingredients market has been segmented on the basis of application into food, beverage, pharmaceutical, animal feed, and personal care. Health ingredients have been gaining importance from pharmaceutical applications segment due to growing demand for functional supplements. Increasing government initiative in the field of fortification and growing demand for fortified food & beverages provide a platform for the increasing demand for health ingredients in food and beverage application. The European region is estimated to account for the largest share of the global health ingredients market, in terms of both value and volume, in 2017. The shift in consumer preference from nutrition-based to health-specific food coupled with increasing awareness about newly invented health ingredients such as prebiotics and probiotics fueling market demand from developing regions such as Asia Pacific are factors accelerating health ingredients market growth. However, people in developing countries perceive bacteria to be bad for health and hence are skeptical about the direct consumption of health ingredients such as prebiotics and probiotics, which are sourced from microbial production. This is the major growth restraining factor for the global health ingredients market in developing countries. The key players have been exploring the market in new regions by adopting acquisitions, expansions, investments, new product launches, agreements, and joint ventures as their preferred strategies. Key players have been investing into intensive R&D activities and also adopting expansions and acquisitions as a mode to enhance their product offerings and capture a larger market share, thus increasing the demand for health ingredients.